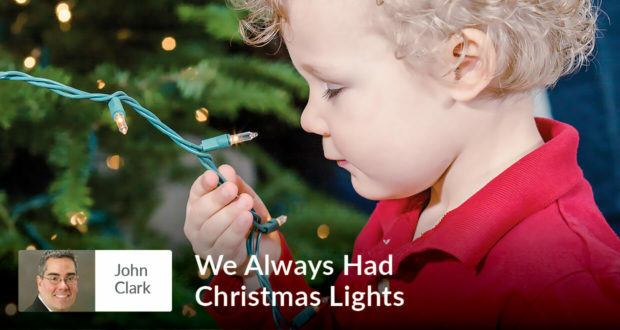 John Clark remembers a family tradition that grows brighter with time – how a father showed by example the importance of Christmas lights to his seven sons. Some time back, I read a news report about a man who complained that his neighbor had the gall to continue to display his outdoor Christmas lights several days after December 25th. Though the neighbor was probably planning on taking down his lights very soon anyway, the man nevertheless called the police to complain about his neighbor. The story, however, does have a happy ending. The police told the man that his neighbor was not violating any laws; turns out, it’s America, so there is no law against displaying Christmas lights on your own property. But when the neighbor found out about the phone call, the neighbor informed the man that he would not take down his Christmas lights. Ever. When I think of this story—in fact, very often when I see Christmas lights—I think of my Dad. You could say that my father and mother never had much money when we were growing up, but “not much” radically overstates the case. They struggled to keep food on the table, perhaps best illustrated that one particular year, our Christmas dinner entrée was oatmeal. They struggled to keep heating oil in the furnace, perhaps best illustrated that we could often see our breath as we sat in the chilly living room. They struggled to keep us clothed. Clothes shopping for us consisted of going to the third-hand store. (The second-hand store was out of our price range.) The store had a deal: for five dollars, you could buy everything you could fit into a provided paper grocery bag. This was a win-win for us: not only did we get lots of clothes, but when we traveled to our grandparent’s house, the paper bags served as luggage. In retrospect, one of the things that I learned from those years—and I know this statement is anathema to Horatio Alger’s telling of American capitalism—intelligence plus hard work does not necessarily equal riches. The truth is that my mother and father are both geniuses and worked plenty hard, not to mention the fact that they are more heroic than I will ever be. A series of misfortunes, however, led to a lack of fortunes. For instance, my father, a Vietnam veteran, had chronic back and shoulder problems from being hung up in a tree after parachuting into communist territory. This, and other combat-sustained injuries, affected his ability to work or even enjoy many pain-free moments. His agony sometimes landed him in the hospital. In fact, one of my first memories as a child was that of two paramedics coming to my house for my Dad, carrying him out on a stretcher and driving him away. I was too little to understand what was wrong with him, where he was going, or when he was returning. Thus, we had very little growing up. At least materially. But we always had Christmas lights. Only later in life, as a father myself, have I come to understand how hard those years must have been on my Dad. He loved his wife and his seven boys, and he imagined himself a Scottish prince who wanted his wife and children to live with him in a palace. But, alas, a palace was not to be his. Instead, he would do the next best thing; he would light our little house in tiny Westerville, Ohio, like a palace. And all of the Clark boys could tell you something we learned from our Dad: in a cold and gloomy world: pretty lights penetrate the darkness—kind of like Christianity itself. Kind of like fatherhood itself. Thanks, Dad.